Universalism. Announcements and arrivals. The coming. Inauguration. Free spirit. Status, recognition and success. Athletics. Good sportsmanship. Anger. Opening, seeding, creation, gestation, detachment, eccentricity, independence, fertile ground, self-germination, a foot in both worlds, storehouse of the culture. The months leading up to the Gulf War were the months during which I began my painting career. I found media coverage of the war to be very oppressive to my newly-awakened feeling nature.To my great surprise, however, I found in my artistry, a practical way of transforming those oppressive feelings into vision. This painting resulted from that process. In the foreground, are depicted the rubble and chaos reminiscent of the images coming to me over the television at that time. In stark contrast to this rubble, we see in the background, a pyramid with seven levels. Each level contains a hieroglyph from the sacred Tzolkin calendar of the ancient Mayan people. I placed the hieroglyphs in this way in ordcr to reveal what my study of the Tzolkin had revealed. The structure of the sacred calendar is such that twenty hieroglyphs are combined with thirteen numbers to yield 260 combinations. Any lunar year consolidates a unique group of 13 qualities. Twenty such groupings are possible. An intimate connection exists between the Tzolkin and the sacred architecture which holds memories of its use. It had been revealed to me that one use of the calendar involves its alignment with the serpentine series of lunar cycles called the synodic cycle of the Moon. The pyramid in the painting depicts one complete lunar year of 13 Moons placed according to this alignment. Each hieroglyph on the pyramid represents a different quality of being and each step on the pyramid refers to a different level of being. The qualities associated with any lunar year are accessible to us through mindful attentiveness to the nature of the thirteen hieroglyphs indicated for that particular year. Each New Moon thus represents entry into an evolving dimension of qualities. The first New Moon of any lunar year sets the qualitative tone for that whole year. The hieroglyphs shown in this painting depict the lunar year "One Ben". 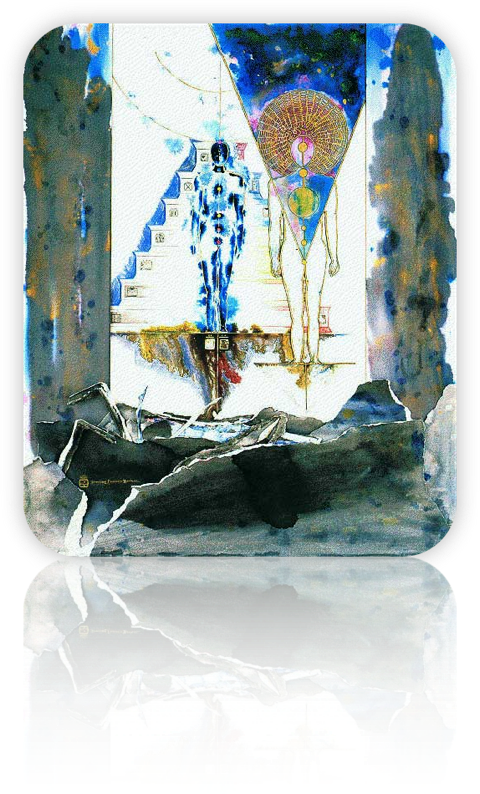 One Ben refers to the qualities associated with skywalking: time/space travel, fluid reference points, courage, new directions, mysterious journeys, compassion, angelic messengers. Number one specifically reminds us of the unity of all land and life. A skywalker relates to life as a sacred journey. The hieroglyphs of the Mayan sacred calendar provide fluid reference points along the way. I, myself, as a skywalker, have consciously travelled this sacred calendar pathway since March of 1986. I consistently date my artwork in reference to the hieroglyph aligned to the Moon at the time of completion of that artwork. 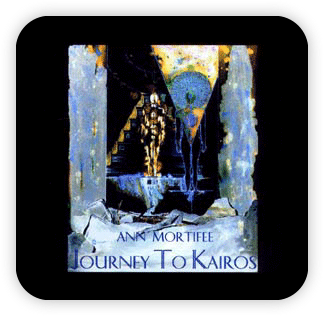 Several years later, I used a digitally altered version of this painting in designing the reissue of Ann Mortifee's music CD Journey to Kairos. Click image for more information. 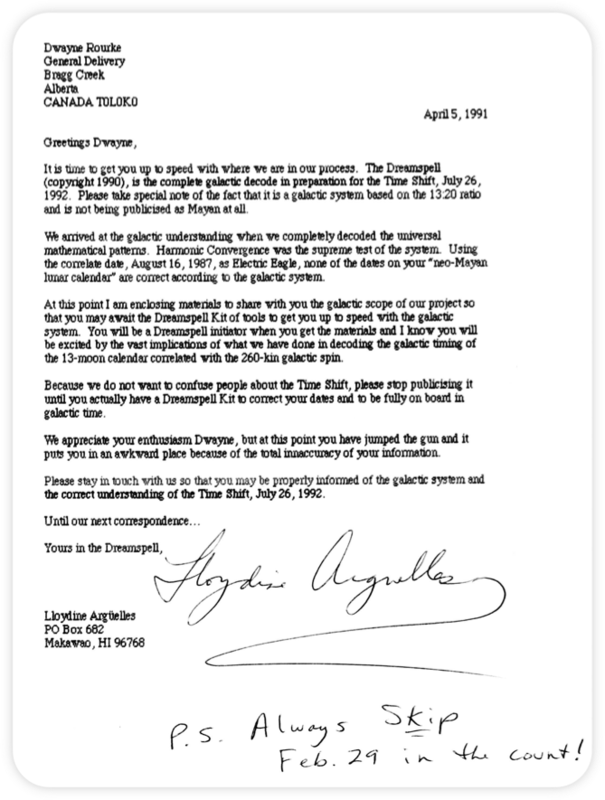 April 5, 1991: Letter from Lloydine Arguelles to Dwayne Rourke regarding creation of The Dreamspell (copyright 1990). I created a response to this letter in the following Moon cycle. To view it, click here.